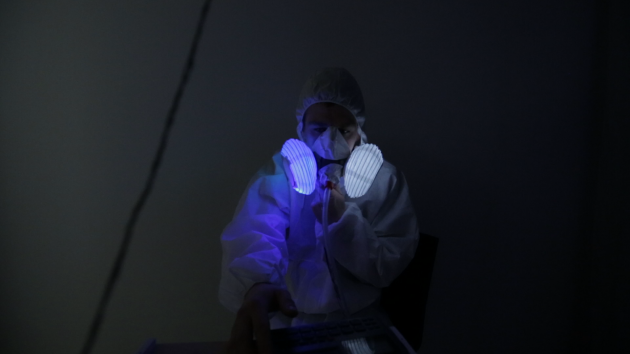 kLUNGTherapy 2 is an environment created for a performative meditation in a sonic installation of breaths, whiffs and respiring “paperlungs” activated through performance. 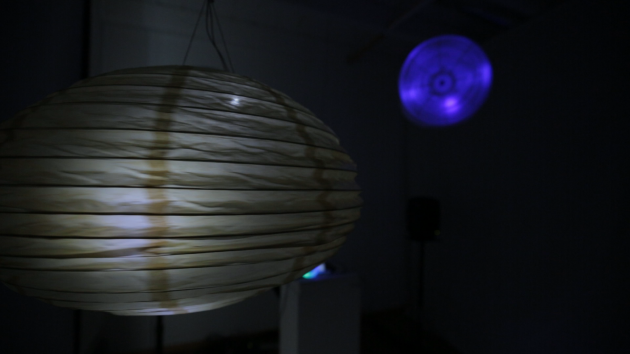 Breathing objects made out of thin paper lanterns are hanging and laying at different levels in the surrounding, illuminated and animated in synchronization with the concomitant electronic composition and the sounds of the performer gasping into a kind of “breathing-prosthesis”, feeding the sound back into his mouth (applying the principle of a talkbox). The performance is combining live improvisation with a set of preprogrammed sequences, triggering a lofi rompler, a sampler with prepared recordings of papercrackle as well as the lights and fans inside the paperlungs. In between the performances the installation was still active by looping those same sequences over and over.